General Hospital (GH) spoilers tease that we’ve got some comings and goings news to pass along. First, let’s talk about a startling debut. On Friday’s GH episode, Liz (Rebecca Herbst) filled Franco (Roger Howarth) and Drew (Billy Miller) in on her childhood best friend. She had some stories about a boy named Terry, who happened to be her first kiss. Now Terry’s all grown up and there have been some big changes! A woman appeared on Liz’s doorstep and we’ll be seeing more of her this week. Cassandra James is playing Terry, who just flew in from Colorado. Terry and Liz obviously have a lot of catching up to do. A nervous Franco will eventually come home to find Liz’s transgender pal. He’ll confess that he’s not as jealous thanks to the new info. They’ll all share plenty of wine and warm moments, so some great scenes are on the way. Other General Hospital spoilers say Cade McWatt will debut as an aged Cameron. Liz’s son will be part of the teen scene now, so look for him to jump right in with Oscar (Garren Stitt) and Josslyn (Eden McCoy). Since Independence Day will bring some fireworks, Cam will join Joss and Oscar at the park for summer fun. In other GH news, Patrick J. Gibbons will portray Wyatt. Soap fans may remember Gibbons from his days as a cute kiddo on One Life to Live. He played Sam Manning from 2010-2012 as well as in the 2013 online reboot. Gibbons is now ready to pop up in Port Charles, so viewers will be anxious to see him. Some General Hospital watchers have been wondering about Mary Pat’s (Patricia Bethune) trusted helper at Ferncliff. Rupert is played by Patrick Cox and he’ll remain a crucial part of Carly’s (Laura Wright) stay at the facility. Thanks to Sonny (Maurice Benard), Rupert should go a little easier on her now. That’s good since Mary Pat’s making Carly’s life miserable! Finally, let’s talk about some departures. Dominic Zamprogna’s final scenes as Dante recently aired. Since we’ve got that Cameron recast, that means Michael Leone’s done at GH, too. Chloe Lanier is also set to exit as Nelle in the not too distant future. 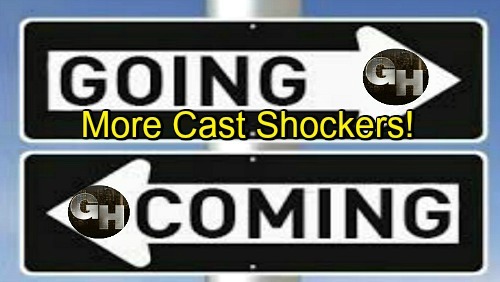 Big news in the casting department as GH has a casting call out for a contract player named ‘Jessica’ and described by SOD as “an African-American actress in her early to late 30s.” Could this be a replacement or recast for an actress who is anticipated to exit General Hospital or is this a brand new character and role? Fans of The Young and the Restless and GH would be delighted if Mishael Morgan nabbed the role! General Hospital spoilers hint that even more cast shockers are ahead, so brace yourselves! We’ll give you updates as other GH details emerge. Stick with the ABC soap and don’t forget to check CDL often for the latest General Hospital spoilers, updates and news.